Reminder, Union meeting tonight at 7pm. Enjoy, and thanks to the guys at 3A for telling me about this hilarious video. I give you Fireman Ross. It is with deepest regret that I bring sad news to the Roanoke Firefighters. Lt. Charles M. Fields, who went by Charlie, passed away due to lung cancer. 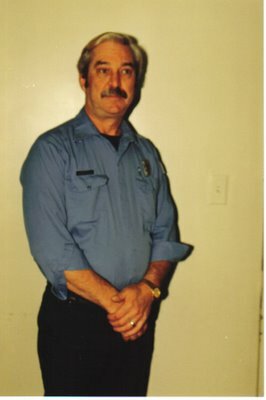 Charlie was hired by the Roanoke Fire Department on January 1, 1965 and retired on January 1, 1999 with 34 years of service. Charlie was stationed at fire station 13 when he retired, although most of the stories I have heard of were of when he was a Lt. on Ladder 2 at station 2. Visitation Sunday (tomorrow) 2-4pm and 7-9pm at Oakeys South (Brambleton Ave). Funeral Services will be monday at Oakeys South and the burial will be at Blue Ridge Memorial Gardens. If you would like to help with the Honor Guard, please contact Todd Reighley at station 7 today 853-2414. Sunday, you can contact me at station 10, 853-2598. Charles Maxwell Fields, 65, of Roanoke, went to be with the Lord on Friday, October 27, 2006. He was a member of Hiram Baptist Church and retired from the Roanoke City Fire Department with the rank of Lieutenant after 34 years of service. Charles was an avid fisherman and hunter, and dearly loved his family. He was preceded in death by his parents, Charles Leo and Bertha Jane Fields, and is survived by his loving wife of 44 years, Loretta Sowder Fields; two sons, Barry Eugene Fields and his wife, Fran Fields of Danville, Charles Brian Fields and his wife, Kandy Fields of Vinton; four grandchildren, David Fields, Kevin Fields, Shayne Fields and Leah Roberts; one brother and sister-in-law, Earl and Carolyn Fields of Salem; one sister and four brothers-in-law, Arlene and Jim Hanson of Va. Beach, Kenneth Sowder and his wife, Linda, Robert Sowder and his wife, Barbara, and Wayne Sowder and his wife, Sandy. A funeral service will be held at 12 Noon Monday, October 30, 2006 at Oakey’s South Chapel with Dr. Don R. Pegram and the Rev. Bob Sowder officiating. Interment will follow in Blue Ridge Memorial Gardens. The family will receive friends on Sunday from 2 to 4 p.m. and 7 to 9 p.m. at Oakey’s South Chapel, 989-3131. Published in the Roanoke Times from 10/29/2006 – 10/30/2006. Roanoke Fire-EMS is currently performing promotional testing for the position of Lt., 1st Lt., and Captain. Approximately 80 firefighters underwent the written testing today. The testing will conclude next week with the practical portion of the testing process. Following the testing, the scores will be tabulated and promotions will likely occur in the end of November. In the middle of November, the recruit class will graduate and soon after join the rank and file members of the department bringing the staffing levels up. The recruit class is comprised of 18 rookies for Roanoke City as well as recruits from Lynchburg, Roanoke County, and Salem. It is this time when the Roanoke Firefighters are shuffled around to make room for the new recruits, and newly promoted officers. This event occurs just about each year. I hope to have something up for the recruits in the next week or so. The troubled Richmond fire department has banned front-line firefighters from wearing their own undies, briefs or boxers while on duty. Both sexes are now wearing mandatory standard underwear and it’s costing the city $16,000 to provide each firefighter with six pairs. The mandatory standard translates into plain, sensible Stanfield boxers, said Richmond city official Ted Townsend. The one-style-for-all is part of the city’s attempts to make the department gender-neutral and provide an environment in which men and women will feel comfortable, said Townsend. Thanks Amanda, for a wonderful story on one of our Brothers. Billy Obenchain will retire soon after 33 years of service with the Roanoke Fire-EMS Department. Battalion Chief Billy Obenchain won’t miss the reheated lasagna and dry meatloaf his firefighters have tried to pass off for dinner at Roanoke’s Fire Station No. 2. But Obenchain is going to miss giving those cooks a hard time. Obenchain, 54, is battling cutaneous T-cell lymphoma, a cancer of the blood. He’ll retire early next year, ending his 33-year career as a firefighter. This is a reminder to all the loyal readers of the RoanokeFire Blog. Over the past year and a half the blog has had thousands of comments. I really appreciate the communication, good or bad, about different events, incidents, and posts. Often, by my comments in a post, I am trying to start a conversation on a topic. All in all the comments have been professional and within the limits of acceptable. Only a handful of times have I had to delete comments which I felt did not need to be read. Most of the comments come from the firefighters here in Roanoke. However a lot of the readers come from elsewhere. Remember, this is not the rumor mill. I would like to keep this site as professional as possible. One person said the other day when he was commenting on me getting “bashed” about a post that I put myself out there. Sure I do. I will not disagree with that. I enjoy the comments, and what you all have to say. I often entertain comments with a reply, but not always. Please remember that the outside is looking in, and that opinions will be formed by what is read. Some things are best left unsaid. The Roanoke Fire-EMS Department is hiring for position of Firefighter/EMT and Firefighter/Paramedic. No experience necessary. Click the links below for more information. 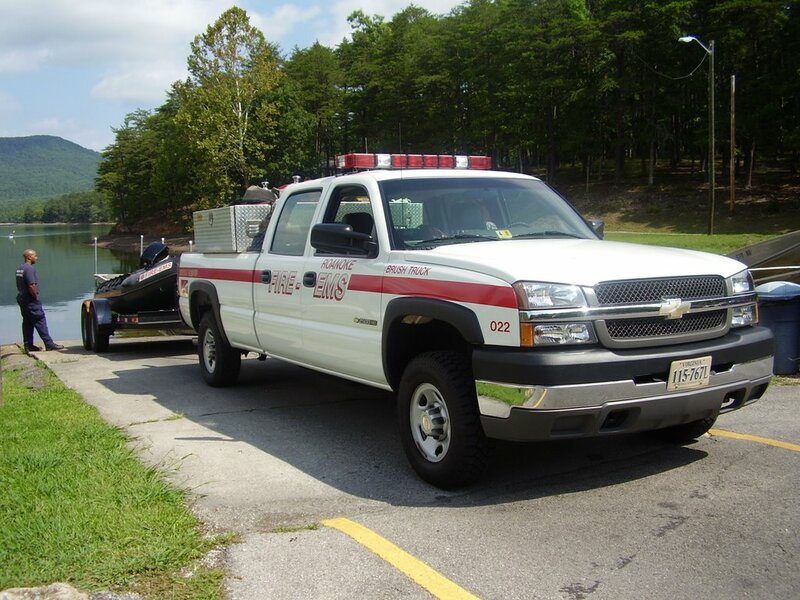 Firefighter/EMT and Firefighter/Paramedic – accepting applications until November 1st 2006. Note the date change as I had previously posted the 4th, my error. The Roanoke Fire-EMS Department is also hiring for the position of Fire Chief. 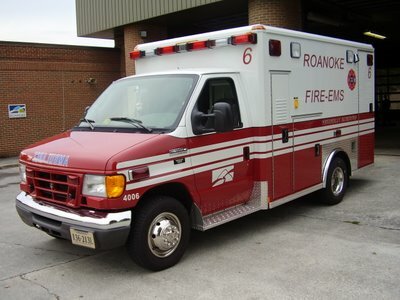 Roanoke Fire-EMS has put a new ambulance into service at Fire Station #6. The new ambulance replaces an older ambulance. Roanoke’s ambulances are the busiest vehicles in the fleet and are replaced about every 4-5 years. The ambulances run a majority of the 30,000+ calls that Roanoke Fire-EMS responds to each year. Roanoke has 7 ambulances in service. Medic 1 is located at REMS, Medic 2 at station 2, Medic 3 at station 3, Medic 4 at station 4, Medic 6 at station 6, Medic 9 at station 9, and Medic 10 at station 10. All of the Medic units are staffed full-time by Roanoke Fire-EMS Firefighter/EMT’s and Firefighter/Paramedics with the exception of Medic 1. Medic 1 is staffed during the day and occasionally at night by part-time EMT’s and Paramedics, as well as being staffed with volunteers during some evenings and weekends. All of the Medic units are staffed with Advanced Life Support (ALS) personnel and equipment. This means that there is at least one Paramedic on the Medic units all the time with any equipment they might need to perform there duties. All of Roanoke’s Engines and Ladder trucks are staffed with Basic Life Support (BLS), which means that there are at least 2 Firefighter/EMT’s on each truck. Currently there are only a few Firefighters who are not EMT’s, these personnel are certified First Responders. On Sept. 03 Captain Marvin Huddleston, Lt. Baron Gibson & Firefighter Davel Muse were assigned the task of assisting the US Challenge, Challenger World team at Carvins cove. The team arrived at 12:00 hrs and by 12:30 hrs. Captain Huddleston had the team out on the cove in the Swift water ZODIAC. The Challenger team had the task of plotting certain points on the cove for teams to find during the competition. They were on the water for about an hour. The photos of the ZODIAC on the water were taken by Digi-scope. The team members names are from left to right, Jennifer Trapp & Scott Bowers of North Carolina and Nicky French Blake & Chris Dowling of the UK. 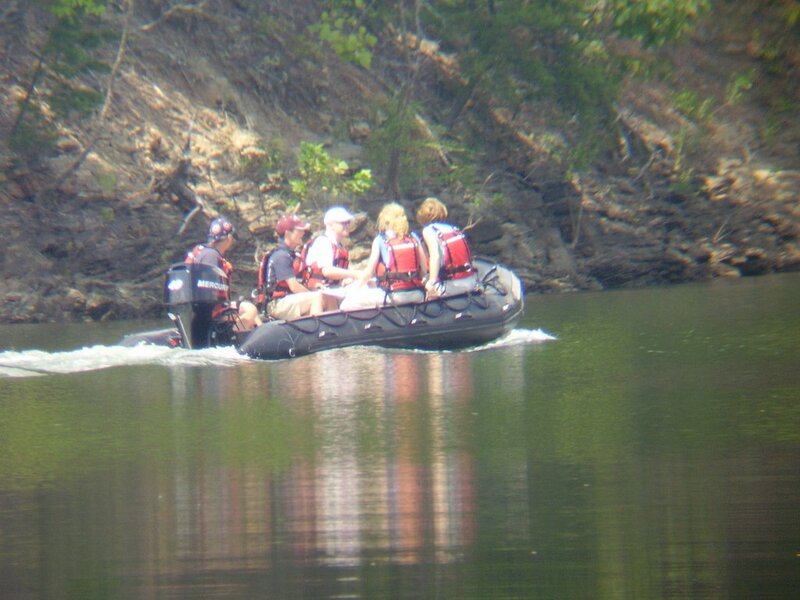 Today, Engine 3, Medic 3, Ladder 1, and the Swift Water Rescue Team converged on the Roanoke River to recover a body that a jogger found while running on Wiley Drive. 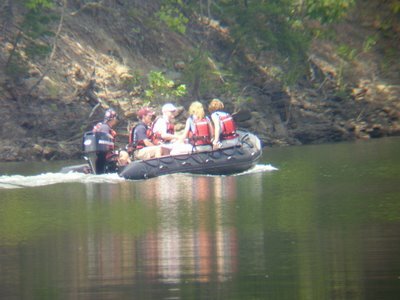 Officals carry a boat to the Roanoke River to look for evidence following the discovery of a body near Wiley Drive. The death of a woman found in the Roanoke River this morning has been ruled a homicide by Roanoke police. Officers were called at 8:09 a.m. to the 800 block of Wiley Drive, near the low-water bridge, where the body of an adult female had been found. No arrests have been made, and police have not released the woman’s identity. Todd Reighley is competing in the Roanoke City Team. The Roanoke County Firefighters entered a team as well. They will be competing around the Roanoke Valley area. Corporate teams from around the country are coming to Roanoke to match strength and wits. The event known as the U.S. Challenge involves pitting small teams from some of the largest companies in the nation against each other in tests of physical endurance and mental agility. So, when Greg Martin notes that he and his fellow members of the Roanoke County government team entered in this month’s event are “fairly competitive,” he may have pronounced the understatement of the event before it even begins today. October 17, 2006 – IAFF General President Harold Schaitberger, Mike Mohler, president of the Virginia Professional Fire Fighters (VPFF) and IAFF members from throughout Virginia announced the VPFF’s endorsement of Jim Webb for U.S. Senate during a press conference held October 16 in Fairfax County, Virginia. Webb is running against incumbent Republican Senator George Allen on November 7. The former Marine, who served as Secretary of the Navy under President Ronald Reagan, supports fully funding SAFER legislation to hire new fire fighters and the right to collective bargaining, as well as staffing and other issues important to fire fighters. Pay compression is one of the issues that many firefighters believe is plaguing our department. Up to this point, I have referenced it but never had to explain it. I probably haven’t explained it because I never would have done the issue justice as it effects us. Today, I found the explanation that I would have loved to have given you. Apparently Danville employees are experiencing similar problems with pay compression. I encourage you all to read the entire article to understand how the problem occurs, how they have been told to fix it, and how saving a little bit of money over time is going to cost them a lot of money in the end. Note: due to a technicality, I put the entire article up. DANVILLE – Danville police officers earn on average about 20 percent less per year than police officers working in nearby localities. Mondul shared his concerns with Danville City Council a few years ago when the police department was experiencing a high turnover rate. Council then hired the private consulting firm Fox Lawson & Associates to conduct a comprehensive study looking at how Danville’s public employee salaries stack up with those of it’s local market, including Charlottesville, Martinsville, Lynchburg, Roanoke and High Point, N.C. The study found that Danville police officers earn $29,900 per year, while the average police officer in Danville’s local market earns $36,162 per year. Across the board, the study found Danville’s city employees on average earn base salaries that are 13 percent less than the same employees in the local market. The study also found the local market’s pay ranges – which dictate the minimum and maximum salaries an employee can earn depending on his or her job description – are 10 percent higher than Danville’s pay ranges. Council is set to look at the problem and take action on a possible solution at their Tuesday meeting. But it won’t be an easy problem to fix, according to Assistant City Manager Lyle Lacy. Lacy used an imaginary truck driver and rolled the clock back five years as he tried to explain how the salaries for Danville’s public employees fell so far behind the local market. Lacy said the truck driver position had a pay range of $20,000-$32,000, which meant when the driver started the job in 2001 he earned $20,000. He said that year Danville and its local market were on an even keel. In an ideal situation, a local government increases its employee pay ranges each year to compensate for inflation so that someone just starting a job can afford to buy the same things a person could buy when they started the job last year. Also in an ideal situation, Lacy said the local government gives its employees a raise each year to reflect the experience they have gained on the job. Though he’s not sure about the details, Lacy said he thinks localities in Danville’s local market increased their pay ranges by 3 percent each year to match inflation. When this happens, he said the employees automatically get a raise, or a cost of living adjustment. Lacy said he thinks the localities also gave their employees a 2.5 percent raise for every year of seniority. This means that the truck driver who worked in the local market got a 5.5 percent pay raise each year. At the end of the five-year period between 2001 and 2006, Lacy said the local market truck driver was now earning $26,139 a year. The local market truck driver position now had a pay range of $23,185-$37,097, which meant any truck driver starting this year could expect to earn $23,185. Things, though, were different for Danville. “We were trying to balance the impacts on Danville’s economy,” Lacy said, adding that as the city’s economy faltered, it had less money in its budget to pay its employees. In lieu of a cost of living adjustment, Danville gave all its employees a one-time 3 percent bonus in 2002. The city made this bonus a permanent fixture the next year and gave its employees a 3 percent raise in 2003. Danville increased its pay ranges by 3 percent in 2004, which meant its employees also got a 3 percent raise but there was no additional pay increase based on tenure. This meant the Danville truck driver who had been on the job for three years since 2001 earned $21,218. A new hire for the truck driver position could expect to earn $20,600. Lacy said this type of a situation – where employees doing the same job are earning the same amount of money regardless of their experience – is called compression. Lacy also said that 2005 was an easy year to figure out, because nothing happened. “I gave a lot of people hugs in 2005,” he said, adding the city couldn’t afford to increase its employees’ salaries or pay ranges. In the budget cycle that ended in July, the city increased its employee pay ranges by 4 percent, which means all of its employees got a 4 percent pay raise. But by then, the damage had already been done. Lacy said the Danville truck driver and the local market truck driver had been working the same job when they started five years ago. But the Danville truck driver was only making $22,066, almost 18 percent less than what the local market truck driver was making. Fox Lawson & Associates recommended the city solve its pay gap problem by immediately increasing its pay ranges by 10 percent. Lacy balked at this idea and said such a plan would cost the city $7.5 million. Lacy said the city’s overall plan to fix the pay gap problem would take three years to implement and that is only if Danville can afford it. Council will look at spending $1.05 million Tuesday night as it implements the first phase of this plan. Lacy’s recommendations to council include raising the city’s pay ranges by 3 percent. Any city employees whose current salary falls below the pay range minimum after this increase will get a raise. “This will bring people back to the boat,” Lacy said. City employees also are set to get a pay raise depending on two things, their current salary and their tenure on the job. Lacy said these pay raises are the only way to deal with compression. Employees with 20 or more years of service who are still in the bottom sixth of their pay range will get the 7 percent pay raise. Employees with the least amount of experience will not get a pay raise outside of the pay range adjustment. These raises would cost Danville $1.35 million, including the city’s contributions to social security and pensions. Lacy recommended the city only make the increases retroactive until Aug. 1, so that it would meet the $1 million figure council included for the plan in its general fund budget. “We’re still busting our budget by $50,000,” he said, adding the pay increases would cost the city’s utility fund $300,000 as well. If council approves the pay increase plan at its Tuesday meeting, Lacy said city employees should see their initial pay raise this month. He said employees would receive their retroactive pay raises in November. But Lacy said these recommendations are only the first step in addressing the city’s pay gap problem. Over the next two years, he is asking council to include $2.5 million in its budget to further close the pay gap and adjust its pay ranges for inflation. Lacy said that he would be against any plan to raise taxes or fees to raise this money and hoped Danville’s projected growth in the future would provide enough money to implement the plan by itself. Contact Mac McLean at gmclean@registerbee.com or (434) 791-7985. If anyone has pictures for the blog, send them in. The RoanokeFire Flickr account has now had over 4000 hits. I am glad you all are enjoying the pictures. The actual purpose for this post was to talk about MySpace accounts. I have heard a lot of firefighters talking about MySpace for a long time now. There are two schools on the topic; the ones who have children who might be using MySpace and the ones who might use MySpace themselves. This blog is my MySpace, or that is how it began I guess, without showcasing myself. This site is all about my career, my craft, and my life. The more personal stuff is on the less frequently updated blog for my family. However, I did begin a MySpace account, not before it was cool to do it. Rather, I did it without knowing exactly what the hell it was. What is interesting is that I can build a website from the ground up, but I still have not learned how to “pimp” my MySpace. Not that it is a big deal. Actually, I do not get on my MySpace account until I get an email on a new comment, a new friend request, or an event listing. I rarely get on their otherwise. My MySpace account was predominately for meeting up with old classmates, than to see what a buddy is doing this weekend. Slowly but surely, I realized that more and more firefighters had MySpace accounts. Even the ones with kids are getting their own to keep a watchful eye on their kids. I am sure that there are some warranted precautions on letting the younger kids use MySpace. If you want to check out some of the Roanoke Firefighters on MySpace, you can check out the friends at my MySpace: http://www.myspace.com/firefleitz, or you can check out the friends listed under the Local 1132 MySpace, or you could even add your name to the list of friends at VAFireNews.com MySpace and/or Firehouse.com MySpace. All in all, I do not see any problems with MySpace, unless you are going to begin dishing your opinions relating to your job. If that is the case, you might want to come talk to me first. Ha Ha Ha. Another feature of MySpace is that it has a blog feature. Let me know if you have a MySpace and I will add you. Ok, obviously due to the comments, you guys misunderstood my post. Let me try and help you understand. When I said my career, my craft, my life I meant FIREFIGHTING. More specifically than that, I meant Firefighting in Roanoke. It seems as though at times, you guys are just ready to pounce. You need to think about this for a minute. I said that this is my MySpace, meaning that this is my site that I started. If you were to look at this entire site, the only reference to the author (me) is the very first part of the sidebar —> on the right. However like you all pointed out it is for the past, present, and future of the firefighters in Roanoke. My attempt at an analogy for those of us who have a MySpace. Furthermore, my point was why my MySpace account has very little to do with firefighting other than pointing to this site. Ok, instead of making several posts, I will be making one post covering several issues. Be sure to read the entire post for all the information, so you aren’t left out. First off, Becky my wife will be leaving for her Marathon next weekend. She is still collecting money that she had to raise for the leukemia & Lymphoma Society. This is the cause she decided to run for, and it is just by coincidence after the last post. I have to admit that I never correlated the two either, however in the last post I told you about Billy Obenchain. Billy suffers from Cutaneous T-Cell Lymphoma. My wife is running for leukemia & L-Y-M-P-H-O-M-A (emphasis spelled out for me). I just never put the two together until Becky pointed it out to me DUH. There is still time to pledge money (Link Here). There is a secure donation link on the right hand side of the page. She only needs to raise a little over $500 more. I figure if everyone gave a dollar or two we might meet the goal. Be sure that if you are going to donate money specifically for my wife’s run to donate here:http://www.active.com/donate/tntva/tntvarfleitz. If you have any questions please feel free to ask. There is another project on the horizon for raising money for Lymphoma Research in the future. I will have more information on that soon. The Roanoke Firefighters have been busy today. One house fire on Harrison Avenue had the firefighters out this morning among several other calls throughout the City. Engine 9, Engine 5, Medic 9, Ladder 13, Battalion 2, RS-1, Medic 4, and Engine 3 are out on a working fire on Staunton Avenue (1929 hours). Searches came up negative and the fire was quickly knocked down. The ARFF crew got another call today, that makes my second call. We had a Dash 8 with smoke coming from an engine. Apparently the starter overheated. No action taken and the engine cooled off. That is two calls if your counting. The recruit school is getting ready to graduate in about 3-4 more weeks. The are looking forward to it. I have gotten to help teach a little bit. I think that we have a pretty decent group this year, same as we have in the past. It will be nice to get our staffing back up and reduce the need of possible holdovers. I have enjoyed teaching a few classes for the recruit school and I will be helping out with one of their burns this friday. I hope to get a few pictures to share with you all. Apparently we will be looking to hold another recruit school in the spring. The rumors and speculation is that we will be staffing Medic 1 full-time. I will keep you all posted as I find out more. From what I understand, the money that was earmarked for the new Fire Station 10 on Williamson Road has been given to the School Board to use on the need for remodeling and building of Roanoke’s Schools. This benefit is to help the Community Christmas Store, a non-profit organization assisting families from Roanoke County, Salem & Vinton during the Christmas Holidays. The CCS served more than 700 families (over 1,200 children) last year! We will have a special recognition at the end of the rid for Cline Conner. Other than that, your Roanoke Firefighters have been busy keeping Roanoke safe. I am always happy to hear from firefighters, citizens, and readers. Feel free to send me any information, pictures, or questions to FireFleitz@adelphia.net or simply leave a comment. I think I owe all my readers a thank you. So here is the thanks to my 3500+ readers each month. If the Roanoke Fireblog didn’t have readers, it wouldn’t have a purpose. Thanks for reading. Chief Manuel and Chief Grigsby are both due some congratulations. Chief Grigsby has been appointed as Assistant City Manager, a position he has been acting in for a while. Therefore, the Chief’s position has opened up at Roanoke Fire-EMS. Deputy Chief Hoback will remain acting in the position until another Chief is decided upon. In related news, Chief Roger Manuel is due some congratulations. Please join Roanoke Fire-EMS in congratulating Battalion Chief Roger Manuel on achieving his Executive Fire Officer Status. This is a very prestigious designation that only two other members of the department have obtained. The officers enhance their professional development through a unique series of four graduate and upper-division-baccalaureate equivalent courses. The EFO Program spans a 4-year period with 4 core courses. Each course is 2 weeks in length. EFOP participants must complete an Applied Research Project (ARP) that relates to their organization within 6 months after the completion of each of the four courses. A certificate of completion for the entire EFOP is awarded only after the successful completion of the final research project. Chief Manuel has been with Roanoke Fire-EMS for over 16 years. In completely unrelated news, I was looking on the City intranet tonight and if you go to FAQ’s, you will find a great picture of Lt. Tim Jordan washing the front of Ladder 13. The words cannot express the joy I feel that Tim has finally come to the front. I guess Stafford is next. I am not sure how I missed this, but I did. Check out this site for a fitting local 9/11 tribute. There might be some familiar faces in there. problems among fire departments. Most of these problems stem from first hand experiences here in Roanoke. However, it should be noted that our problems are the same which exist across the Nation in the best and worst departments. One issue we have is pay compression in our ranks. Recently this issue has gotten worse due to a raise given to the Paramedics and Intermediates. This raise was shelled out to correct another problem, retention. I agree with the raise, and I think that it is well deserved and the correct amount. What I don’t agree with is that we have made another issue worse. Ever since the Fire Department merged with the EMS Department in 1995, the Paramedics have felt like red headed step children. Paramedics do not have any forward progression to move up other than becoming an officer on an Engine or Ladder company. In case there is any question, the answer is yes. Just as we have firefighters who do not like EMS, we have EMT’s who do not like Firefighting. What I offer you is a solution. Realize that I am not a City planner, or one of those high dollar consultants. I am merely a firefighter. I am sure many of you will offer amendments to my ideas, I hope you do. Maybe this will offer some insight to possible solutions. There are some other issues to be cleared up though. Before the merge, the firefighters were given the option to become EMT’s. This began in 1991, and the pay was offered at $100 a month ($1200 yearly). Today, almost 16 years later, that pay has not changed once. The EMT pay is not added into the firefighter’s salary, therefore their raises are not figured on it, and it is not figured into their pensions. It is merely a stipend. However, the paramedics received extra money which is figured into their raises and pensions. Since everyone is so big on the Cost of living, let us look at the past 16 years and increase it by that much, and figure it in on raises (going back to the beginning) and pensions. This seems fair to me. I think that most of this money is reimbursed by the State, so you will have to battle that one at a higher level. Currently the HazMat Technicians/Specialists receive $100 a month. I am not sure when this started, but it is probably due for an increase, and make sure that it is figured into the raises and pensions. As for the terminology changes, let me explain. The Paramedic or Technician pay grade is for Paramedics and Apparatus Technicians. All rookies will start out as pay grade 11, no matter their certification. Once they have been cleared as an AIC on the ambulance they will move up a pay grade. The testing for this level is held at the regard of being a nationally registered Paramedic or Intermediate. This pay grade is also for Apparatus Technician. This would require a test, similar to the newly rolled out Roanoke DPO thingy, without some of that nonsense (that is another post all together). Once you reach this level as a Technician you will be able to drive when the Lt. or Capt. is off. You could be a Paramedic and Apparatus Technician, but that doesn’t mean more money. The fire Lt.’s would be the same as they are now; they drive the engines and ladders. The EMS Lt.’s would ride the ambulance, or backwards on the fire trucks, and be allowed to take command of EMS incidents. Theses Lt.’s could also ride on RS-1. You can transfer laterally from one to the other. Captain I is the same as 1st Lt. now. The EMS Captain I would ride RS-1 and be allowed to transfer laterally to Captain I Fire. Captain I – Fire would ride the ladder trucks or in the case of Station 10, the engine. This is for senior Captains. The Captain II would ride the seat of the Engines. Hopefully this would take away some of the pay compression, allow for progression of everyone, and equalize the extra “moneys” some of us receive. Let me know what you think. First Due: Fire/EMS Gear recently celebrated its Grand Opening two weeks ago. First Due is located at 1806 Thompson Memorial Dr. Roanoke, VA. 24019, just up the street from the RoanokeValley Regional Fire-EMS Training Center. The business was opened by Jarrod Fuhrman, a Roanoke Firefighter. First Due offers an online store which is available to use, however I am told that there is still a lot of merchandise to be added. FIRST DUE IS SOUTHWEST VIRGINIA’S NEWEST DEALER OF PERSONAL PROTECTIVE EQUIPMENT FOR FIREFIGHTERS, EMS PERSONNEL, SWIFTWATER & TECHINCAL RESCUERS AND ANY OTHER PROFESSIONALS THAT DEMAND TOP QUALITY, HARD WORKING GEAR FOR PROTECTING THEMSELVES 24/7. WE ARE COMMITED TO BUILDING A RELATIONSHIP WITH EVERYONE THAT CONTACTS US, WHETHER IT BE A FIREFIGHTER, A DEPARTMENT HEAD OR A FAMILY MEMBER TO ENSURE THE HIGHEST POSSIBLE CUSTOMER SERVICE AVAILABLE. FIRST DUE CARRIES THE MOST RESPECTED GEAR THAT IS MANUFACTURED WITH PREMIUM CRAFTMANSHIP AND THE HIGHEST STANDARDS. WE ARE PROUD OF OUR COMPANY, OUR PRODUCTS AND WE LOOK FORWARD TO SERVING YOU. THANK YOU FOR VISITING OUR WEB SITE. Tell them you saw the information on the Blog. It is good to see more and more firefighters getting out and starting their own businesses. If you have a business you would like mention of, let me know. I haven’t paid complete attention to the reading lists for Roanoke’s promotional tests, although I think I saw a couple books on the site which might be included. I have redesigned the website for a more user- friendly view. Look for more new stuff in the future. I have plans for some big stories, I am working on getting some research completed for the post.